All You Need is Love… and a Cat! You have until 7am ET, Friday, July 13th to leave your comment and be eligible to win. Only one comment per person please. One randomly selected winner will be posted on the July Release Winner Page by 10PM ET on July 15th. To see more from Betsy Veldman, CLICK HERE. To see more from Heather Nichols, CLICK HERE. Thinking of you is great set at at great price too. So many possibilities for the shape shifters square! Love the curled up cat and this month’s Mix n Mat! Such amazing creativity in each and every card! Love the shape shifters square 2! Oooo . . . the shape shifters die is gorgeous!!!! And I love those cats (I’m kind of a cat person!)!! All you need is love and a cat is one of the best sentiments ever. I love all the cat cards – this set is definitely on my wishlist! who could resist these cats and those little footprints of the cats, too! I love the new square shape shifter and the Thinking of You set. Nice job as always PTI! I’m completely helpless when it comes to kitties! Kit N Caboodle is darling… Have to have that set for sure! I love those square Shape Shifters & the DT has really created some amazing creations to showcase them. The kitty set is purr- fect for any age! A must have! That cat cracks me up! More great inspiration from the team!! Some great idea for the Shape Shifter Square die, and those cats are truly adorable! The cats are adorable! 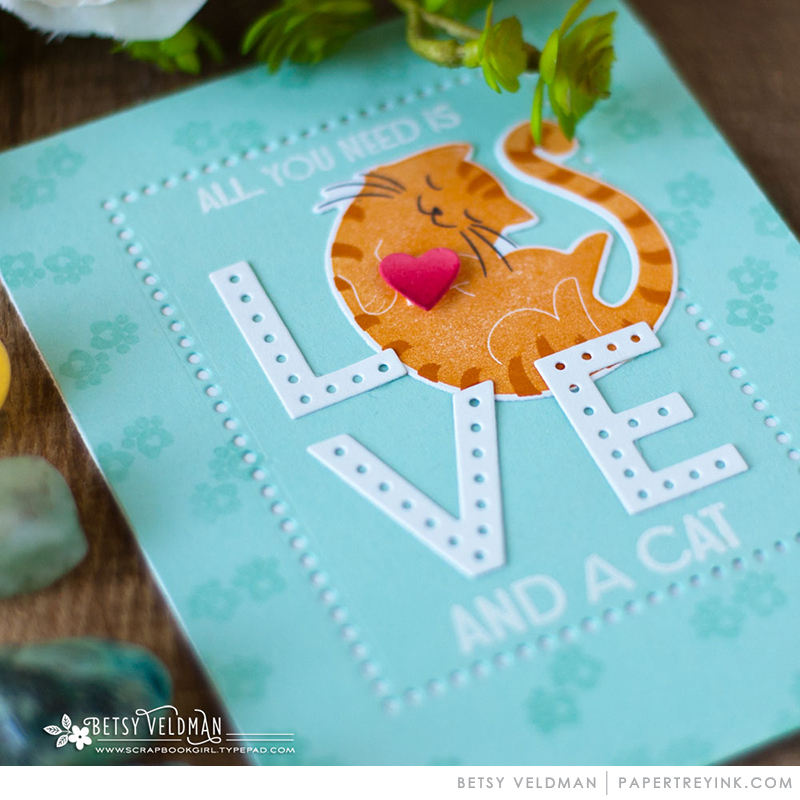 I have lots of cat friends who will love cards made with these! Thinking of you is a beautiful set, I love the backgrounds created, shape shifters are great. Ahh, the kitties are so cute! Love the “thinking of you” and shape shifters as well! Those kitties are adorable! I’m always looking for cute cat stamps. Heads up! Cat lovers! How can any of us resist these cute felines???? The Shape Shifter: Square 2 is adorable. Love those kitties and hope we get a doggy set as well. Love today’s new products, but I have to admit the cute cats made me cry, since we lost one of our sweeties yesterday. We found her in a field nearby after she had not returned home for dinner. She was probably hit by a car while crossing the road. The Shape Shifter is gorgeous and the cute kitties are calling my name! 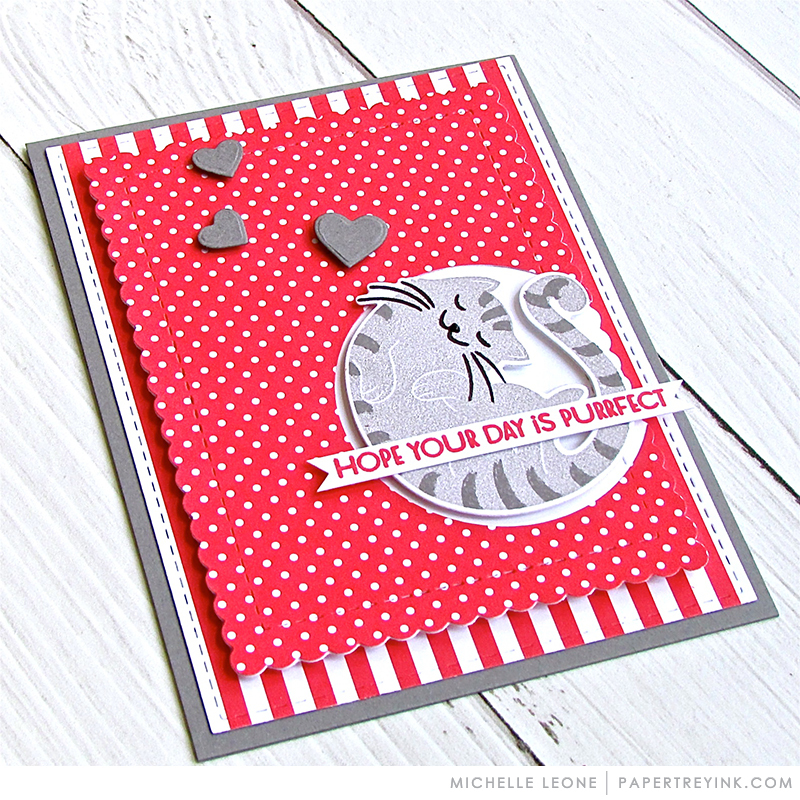 Cute cat stamps and projects. Well done, Lizzie! love those cats! So many cute options! The shape shifters square is a great idea and makes for a lovely background. Can’t wait to play with it. Those cats are so cute and I love the new square die! That is the most adorable cat set EVER! What a great product – love all the samples as well. Love the Kit n Caboodle set….can’t wait to play with it. A happy greeting to the design team, all who have done a WONDERFUL job with your new products. The kittys are adorable and I always love the Shape Shifters! Interesting, intricate dies. They will add quite a splash to cards. I’m not a cat person, but my daughter is! Once again, a great variety in this release! Samples are beautifully well done!! I’m smitten with the kitten! The Kit and Caboodle is super for making cards for the cat owner and lover…….I have several on my list. I love the shape shifter die and I love what all of you did with it! So many fantastic ideas! Super cute cats! 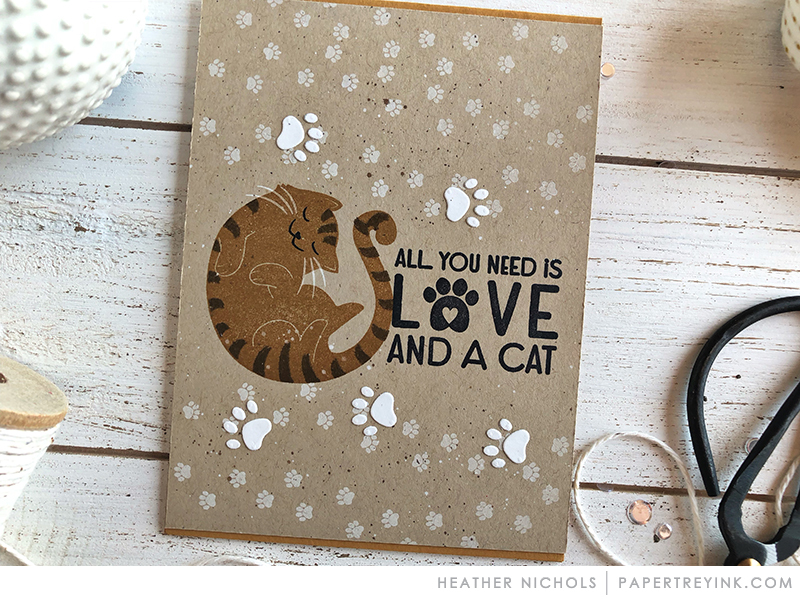 My daughter-in- law is a cat lover and this would be perfect for cards for her! The cats are purfect! So cute. As always you give us the best floral! Love all the different looks you can get with the shape shifter set. Oh my! The new Shape Shifters: Square 2 is fabulous! I love the thinking of you set! Thinking of you and smiling is something I would use all the time. Purrfect cat set! Great sentiments and she wears a birthday hat so well! So cute, more items for my wishlist. Love the cat stamps. So adorable. 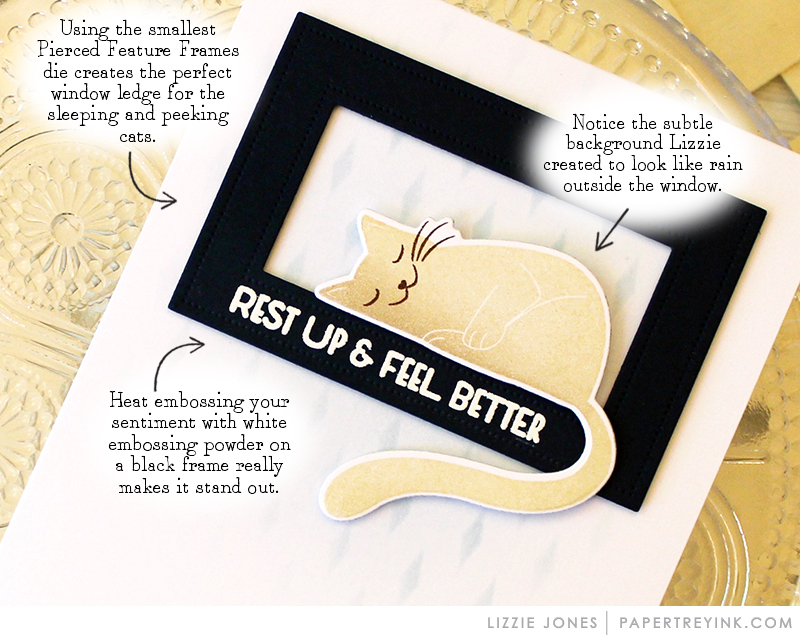 Those cats are fabulous and I love all the little design tips given through the post. Wow-ee, love these examples – and so clever and colorful! I’m really tempted by your very cute cats! I’m feline fine about Kit n Caboodle : D.
Kit & Caboodle is super cute! Great set Lizzie! Love all the cards everyone made with it too! Those cats are so cute! And I love the Pierced Feature Frames die – That’s a must have! How did you know I needed a cat? =] Just as sweet as can be! Lots of great projects today showcasing all the new products The cat stamp would be purrfect for my cat loving family and friends! Loving the versatility of the cat set! The cats are adorable, and I love the fonts in the thinking of you set. The cats are adorable and the square die is gorgeous. Sweet kitties! Wow, the shape shifter cards are so lovely! What inspiration! Cute cards today! Love the font on the Thinking of You sentiments. Not a cat person myself, but I have a few friends that are crazy for their cats (maybe crazy cat ladies). They would love cards made from this cute stamp set! Love those cats and the shape shifter die. I love the thinking of you set. The font is gorgeous. I also love the new shape shifter die. So many uses for it! Kit and Caboodle- gotta have!! I love the shape shifter-square die, and all the sample cards using it are gorgeous! Such clever ideas! Ok, simply adorable cats! Love the square shape shifter. Such pretty designs on the projects! You can’t go wrong with love and cats both are purrfect, well maybe not but the set is perfect for my granddaughter and I who both love cats. I love the intricate designs of the square shape shifter. Those cats are so cute! Love the shape shifter die and the amazing cards shared today. Where do I begin?! Kit ‘n Caboodle – thank you Lizzie! The curled-up cat is the best! Dawn’s birthday card, Melissa Phillips’ card in soft colors, Laurie’s birthday card, Heather’s kraft card, Michelle’s perfect card, and Heather’s one perfect iris with a garden trellis next to it! What a feast for the eyes. You totally have my number with the adorable Kit ‘N ‘Caboodle set! Can’t wait to get those and start creating all sorts of cute cards. Even my dog-lover friends won’t be able to resist these kitties. That cat is so cute, also love the shape shifters! You’ve captured my kitties, Lizzie! LOL LOVE them! AND the Thinking of You looks FABULOUS TOO! We ALWAYS need to know we are thought of & others enjoy being thought of too! AND the new Shape Shifter Die…. MY FAVORITE for today, Betsy!!! BEAUTIFULLY USED by all of you ladies! 😉 Show cased WONDERFULLY!!! So excited about this new feline set….I love my cats so much, and this set is unique, fun and adorable. Can’t wait to get my paws on it! My goodness are those cat stamps cute, cute, cute! I can’t wait to get my hands on them. Another great sneak-peek! Great post today. I look be the new shape shifter as well as a the thinking of you set. Fun post! I love Betsy’s Shape Shifter dies. There are just so many ways to use them. Love all the great inspiration from the design team. Love the Shape Shifters die for this release! Cool Moroccan look, and those bright color combinations are awesome! And the kitty set – irresistible! Thanks for all the inspiration, can’t wait to get my hands on these sets! I love the cats, so fun and unique!! The shape shifters is also great, sure to be a favorite!! Another great release!! That cat set is really charming! And I love the new square shape shifter die — it’s got that funky vibe that I love! Cuteness overload. Love the new stamp set and the new shape shiftier. Love the new Shape Shifters! These are purrrr- fectly adorable! Super cute kitty set! Oh, I love it! The curled up kitty is so sweet! The shape shifter square is so elegant. I also like that it’s square. Lovely samples ladies! I didn’t think I’d want the Shape Shifters: Square 2 but after seeing all the gorgeous creations by the Design Team it’s now on my list! All You Need is Love and a Cat is very cute and useful and I love the sentiments! Love, love, love the cat set. Can’t wait for release day! I’ve been waiting to see the new shape shifter square 2 projects! I love this one, beautiful projects! Oh, that kitty popping it’s head over … so adorable! incredible talent by the DT – thank you! Love the shape shifter die and all the great creations by the DT. Everyone who knows me realizes how very much I love cats. All breeds and hues of kitties big and small – with a special love of the Siamese. Currently my Sterling blue-point is attracted to my crafty room at the sound of a scissors cutting paper. Sterling enjoys the paper scraps to carry in his mouth,. he bats the scraps and play attacks them before returning for another afternoon nap. PTI – I am in love with all the Cat Loving stamps and clever ideas. Can;t wait to play with these too! 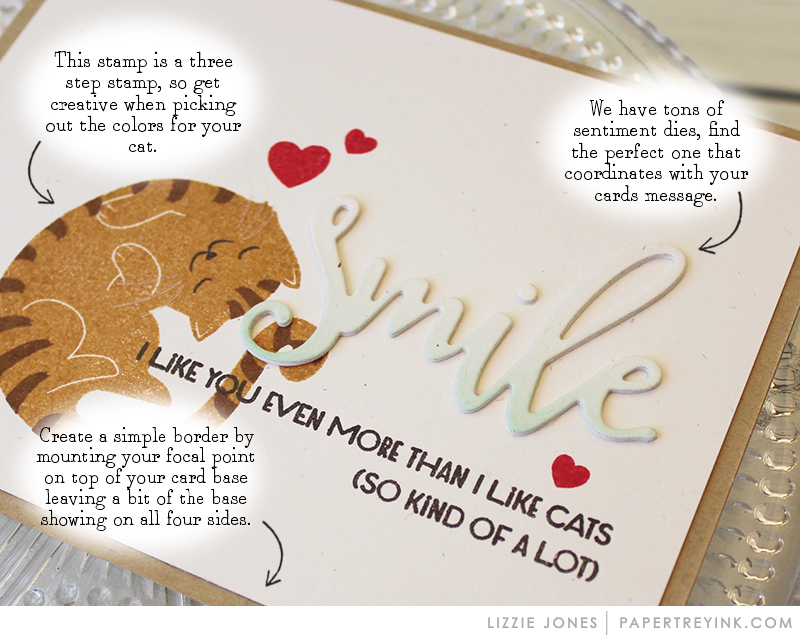 The cat stamps and sentiments are so cute! Love anything that pertains to cats!! I’ll definitely be adding the newest ‘Shape Shifter’ to my collection – Great projects today! Wonderful release! I love the projects you have created with the new stuff! I’m really enjoying the release this month! PTI just keeps upping the ante! And I’m loving the Shape Shifter does this month! Love the cats they are absolutely adorable! I’m more of a hamster person then a cat person, but even I just love all of these kitties! The new shape shifter is very unique and super cool. Love the shape shifter dies….so much fun! So many sweet projects today. So many gorgeous cards! The DT is amazing! Love every one! My son would love to receive a card made with those cats! Love all the cute kitty projects today! LOVE those kitties so cute!!! Love the new cat set! So cute! 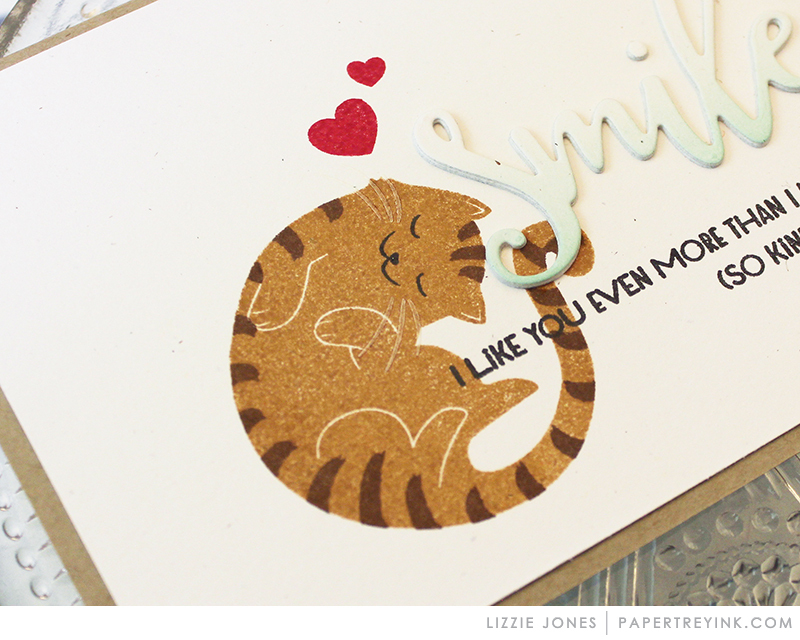 Love the cat set and the next installment in Sentiment Staples! Can’t wait to play with both! Love all of the new products today. Since I am a cat person, Kit and Caboodle are at the top of my list. What a fun set! So in love with the kitties! My tuxedo cat looks exactly like Lizzie’s. Can’t wait to play with this set. ADORABLE! Those cats are so cute. I love the one curled up in a ball and the one with the party hat. Thanks for my smile this morning! Nice to see some of the previously released stamp sets pop up today! Self confessed crazy cat lady so this set is a huge YES for me! Awesome samples today! I am totally in love with all the cats! I wasn’t sure about the cats when I saw the preview, but now I know – I love them! Such cute projects today! Kitties and Shape Shifters, another great day at PTI! Love those cute little cats! That Shape Shifters Square 2 is calling my name. Loving all the beautiful inspiration! The party hat cat is very fun! I love the Kit and Caboodle set! Of course, the square shape shifter is a must have! Wonderful designs! You all are “killing me softly” with this release!! I don’t know how you do it but I love what you come up with. You’re stretching my color and design concepts with each day! Great job ladies! I am loving this release, and can’t wait to get my hands on those kitties. As usual, the inspiration projects are amazing. The new square is So versatile! I NEED one. This is a fabulous stamp and die release! It’s suited for any occasion really. Love these cats which are depicted so well in the stamp designs. Can’t wait to have these sets of my own! The cards made are very inspirational and well done! I love the cats! I have always had cats for pets. Always a great release and wonderfully created cards!! I am a word girl. Your sentiment statements are one of my favorites. Love the smaller sayings with the greeting. I love all of these samples and the creative geniuses behind the cards! My list is getting longer and I’ve already started filling my cart with older products that I’ve never seen. Such cute projects with these new products, love them! Great new designs and all those talented creators on staff!! Who could resist? Fun new release!! The Sentiment Staples series is so great. Very cute kitty cards today. Can’t wait to see Scallop Stackers and the Pierced Feature Frames. I’m not much of a cat person, but I have to admit — these kitties are adorable! Today’s Shape Shifter is a perfect example of a product I didn’t think I wanted, until I saw all the awesome and innovative ways the DT presents it. Nice work! My cat approves of all of the images of her fellow felines, although she wonders why she wasn’t contacted first for a private sketching session? 🙂 Fun release day. Some elegant and some fun release products. What a great mix! I am in love with the new shape shifters: square 2 die. I’m a sucker for patterned dies. I love all the projects from the design team! My Mollie kitty thinks those kitties should NOT come to my house. But……. Love the new shape shifter!! The cats are very cute!! That would make a great gift for the cat lovers in my life!! LOVE the cats! Also love all the ideas for using the new Shape Shifter. Oh my gosh! All the cat card samples! They are all great. My cat loving friends are gonna love this! Super cute cat cards, and the new Shape Shifter die is a great addition to the series! 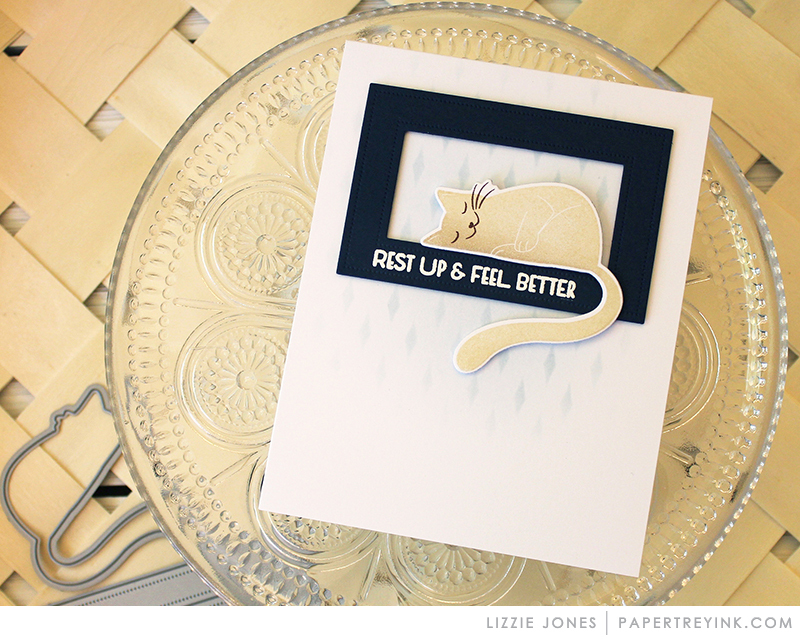 Being a cat lover…Lizzie’s new kitty set will be in my cart for sure! Really like the Shape Shifter this month. It reminds me of a quilt. It’s so pretty!! Sweet and adorable new products! Those kitties are just too cutes. More fantastic inspiration projects – serious talent here at Papertrey Ink! Shape shifter dies are awesome! Kitties? KITTIES! Yes, please, I will have the kitties!!! 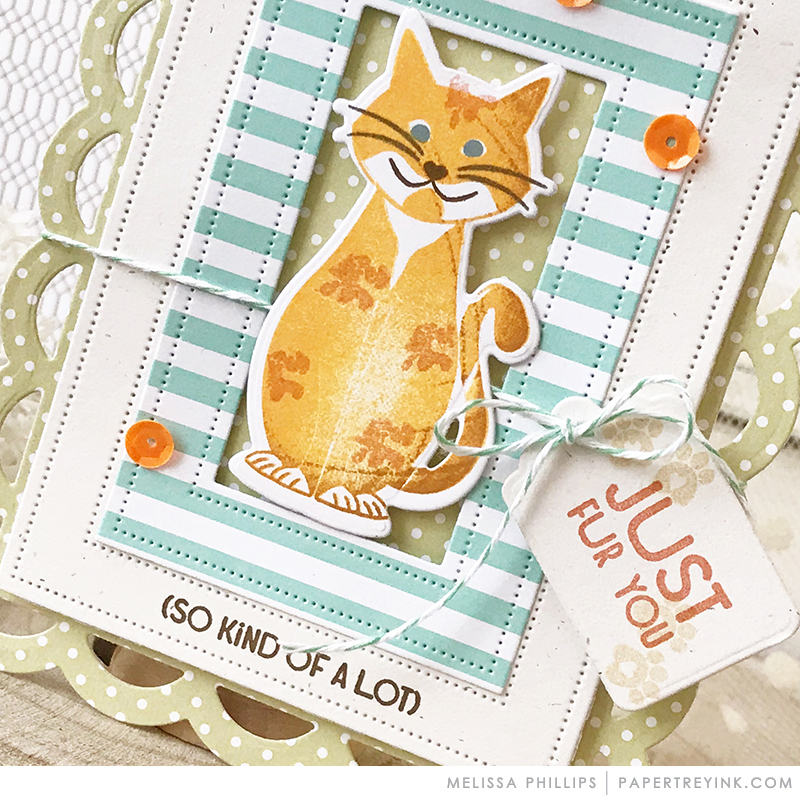 I love what Melissa did with the new Shape Shifters dies! Cute cates. 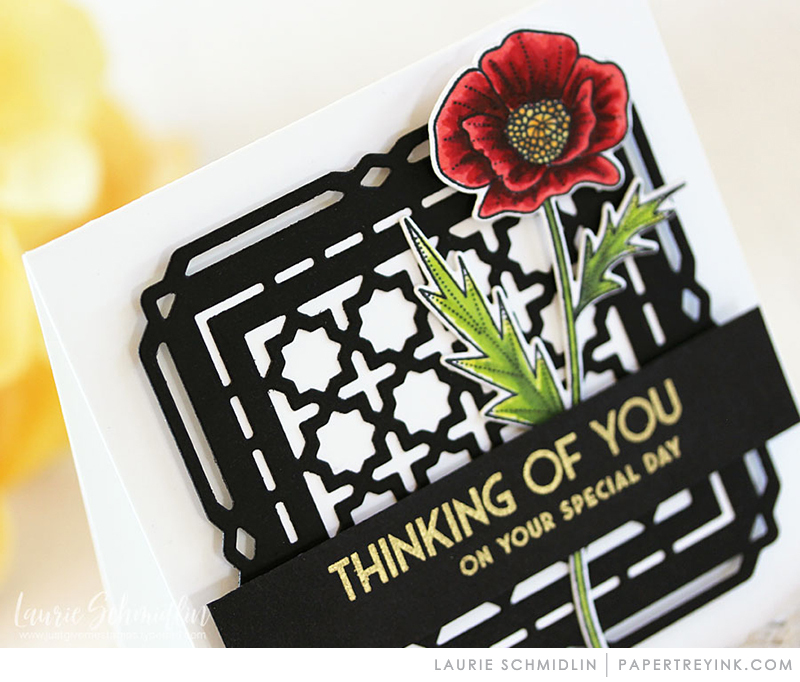 The new shape shifter is a great addition to the series and I love the new thinking of you sentiments and the fonts you chose. Wow, I love all of this, especially the cats! Awww!!! Super cute kitties!!! Beautiful products!!! Love so much all the Dt’s cards!!! Oh, boy, cats are so fun! And I’m needing a thinking of you set. Love the adorable cats, and all the great projects! LOVE everything about today’s post. Kitties and shapes and colors, oh my! I love all the projects for today. You can never have enough Thinking of You stamps! Beautiful Shape Shifters! Love all the cards today! The cats are adorable too. Especially love the party hat! Love the new Shape Shifter! Great projects! I love the new Thinking of You set. Exactly the kind of sentiments I love to send! The design team has come up with a lot of unique ideas to use the shape shifters dies. Can’t wait to get the newest square one. The cat stamps are awesome! Fun designs. Such BEAUTIFUL release!!! Kit ‘n kaboodle is adorable! Love the new Shape Shifters, and the Thinking of you is wonderful! Oh, that kitty set is so adorable! I’m liking the new shape shifters die and the kitties are cute, even though I’m not a cat person. LOVE the cats!!! So cute! Love the shape shifters square, so many quilt possibilities too! Great thinking of you sentiment set!!!! And a cute cat set … the cat person in my heart is happy. Thanks for inspiring, PTI! The kitty set is going to be so much fun. All of the cards are beautiful as usual. Keep up the good work everyone. Love the cat set. I have my own and so many folks who will love this. I am a dog person (because my DH is a non-cat person) but I can’t resist the smiling kitty….also love the shape shifter and some frames that are coming up. I am a very big fan of the shape shifter series and this month is a great addition to the set-but I must say-those cats are just so adorable. Thanks to everyone at PTI for giving us great examples of how to use these sets in a variety of ways. I really like the Thinking of You set and I appreciate that they are so affordable which allows me to accumulate several sentiment sets. The Shape Shifters die is also catching my attention and I love how the designers come up with so many unique ways to use them. Simply amazing designs today. My wish list is growing. I love the shape shifter series and this month is another great addition to the set. But those cats-to die for! Thanks for showing us great examples of the variety of ways to use PTI products. Love the new Shape Shifters die!! Fabulous cards by the members of the Papertrey Ink Team! The Shape Shifters die is awesome. And, all the designers projects using it….love! I can’t have too many cat stamps with a cat-loving niece! Adorable. Love the other products shown today also. The Kitten caboodles are a must have but oh wait so is the new Shape Shifters design die! I can see my poor little piggy bank getting broken into again! These are wonderful! Thanks so much for your great designs! Love Betsy’s new shape shifters. Lots of fun projects today. I am SUCH a cat lover! These cards are fabulous! For a cat lover this is wonderful! The cat set is adorable! Love the “Thinking of You” sentiments and the Shape Shifters die! The projects you all made are wonderful. It always amazes me to see so many different takes on the same sets. There are so many possibilities! Kit n’ Caboodle is just darling. I love that you have an image of a cat exposing his tummy. Such fun images. Bound to be a kit. Another “Sentiment Staples” set to add to my wish list! I love the versatility these sets offer with their combinations. The kitties are so cute! Cute kitties. This stamp set looks like loads of fun. Oh my gosh, I love the cute cat set! So much fun! Fabulous products & inspiration projects. Wow! What an adorable cat set. So fun and so cute. fun and colourful projects today! Very cute kitty set. Love the new square die. Thinking of you–can you have too many of this phrase–never. This is the cutest set of cat stamps….. Such cuteness and elegance today. I’m not even a big fan of cats but think Kit ‘N Caboodle will make it on my list! Sentiment Staples: Thinking of You is a must have! Love the new cat set! Great projects from the DT today. Love all of the adorable kitties. I’m falling in love with the Kit’ N Caboodle graphics! I’m not a cat person, but I know a few who would love a card made with this set. Love the kitty set. So cute. I can think of so many friends to make cards for using Kit ‘N Caboodle!! Totally going to be one of my favorite sets of all time! Love the shape shifters die! A lot of cute samples! I really don’t need yet another cat stamp set, but that peeking cat is the cutest thing ever, so of course it’s on my must-have list! Love, love, love the shape shifters! Great projects today! Cats are my favorite! The die looks like a lot of fun too, with so many possibilities. Kit ‘N Caboodle is adorable – I hope you’ll do puppies next! Kit and Kaboodle is at the top of my list! Amazing cards! Love it all again today!! I’m lovin’ the new Shape Shifter. The new Thinking of You set is a great additions to a great series. The other series I an loving this year would be the Shape Shifters. 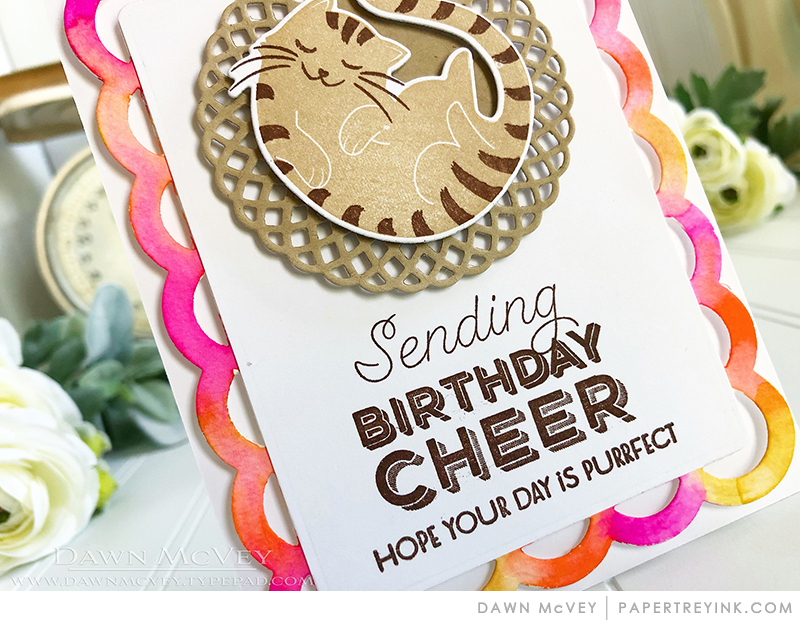 There are so many ways to use them to add interest, texture and layers to a card. Oh the kittens! So much cuddly cuteness from the DT with this sweet set! Definitely at the top of my list! Love the new Shape Shifter!! What fun cat stamps! They will definitely be finding a place in my cat loving home!! Who knew that the new shape shifter die could be used in so many different ways? Thanks for all the inspiring ideas! I loved them. Nice fonts in the Thinking of You set. I’m not a cat person and I don’t know many cat people but Lizzie’s set is too adorbs. My neighbor had a cat named Topaz. He was a tabby. He used to spend his summers on my front porch. (My neighbor’s children and DALMATION used to come in the summer! More great cards and “purrfect” Release! Great post today. I really love those cats. Love those cats… adorable!! As always wonderful inspiration from the designers. Great new products and the design team has beautifully showcased them. Looking forward to the release. I’m not a cat lover, but the images look so cute! LOVE Kit ‘N Caboodle!!!! It’s so cute! Can’t wait to stamp little kitties with it! Kit ‘N Caboodle is darling! A must have for my collection!! Gosh, the peeking cat image in Kit n Caboodle is just so darn cute! I can’t wait to get this set – thank mew! Great stuff! Kit n’ Caboodle is adorable! The Kit ‘N Caboodle set is so cute (love that name too). Another stunning entry in the Shape Shifters die series – Betsy knocks it out of the park again with all that incredible detail. 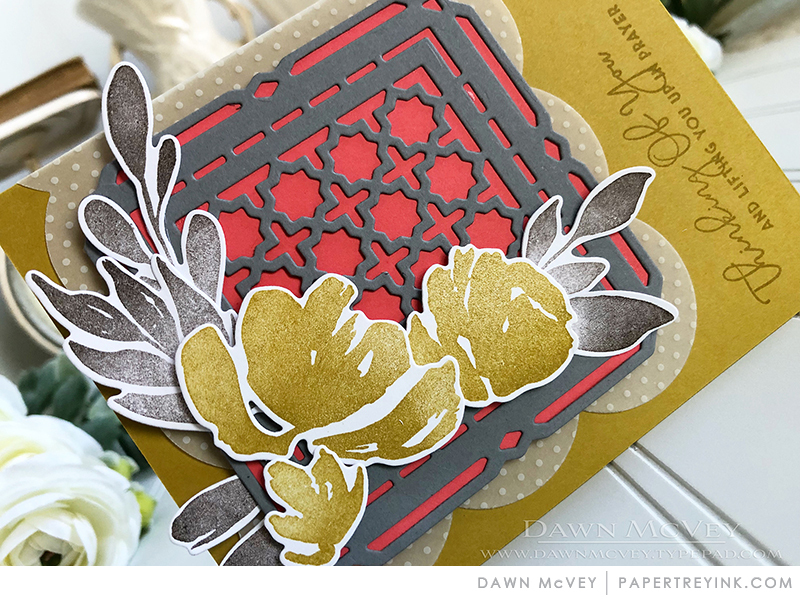 I adore the inlay patterns created with the Shape Shifter die in Melissa Bickford’s sample card above – just so wow! Adore the Kit’N Caboodle and everything else of course!! Oh, those kitties are adorable! The kitties are so cute!! Beautiful inspiration designers! Those cat cards are all ADORABLE!!! How cute, who doesn’t love cats?! I love the Shape Shifters, and this may be my favorite one yet! Oh, I cannot tell you how exciting it is to see some new cats join the PTI family! Lizzie picked out the best sentiments too! Looking forward to seeing the Sentiments Staples full release. I love to come and see the new ideas for release. I can only hope a dog set is coming too. The cats are cute but I need MORE. The cat set is so adorable! Great cards examples today. Oh my gosh, the kitties are so cute! I’m not a cat person, but I may need this set! 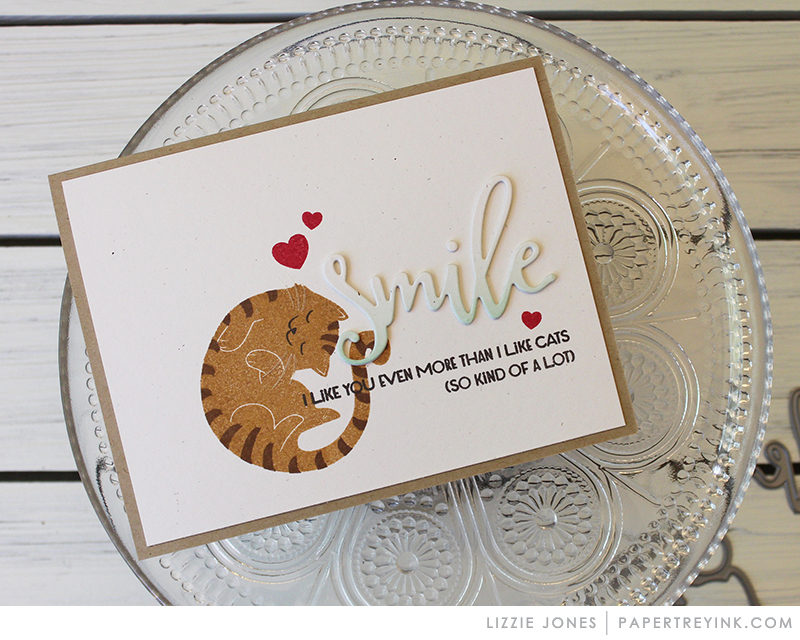 Lizzie’s Kit n’ Caboodle is a hands down favourite for me, love every cat and the sentiments. Loving the detail in the new Shape Shifters Square too! I’ve been hoping PTI would do a cat set!! The Shape Shifter series is so wonderful, perfect for framing focal points but able to be used on their own as well! The cat set is adorable and I love the new Shape Shifter Die. As always wonderful cards again!! The new Shape Shifter is my favorite today. Keep the new items coming. I love all the ways you can use the shape shifter!!! The Kit and Caboodle set is cute. Such fun cards. 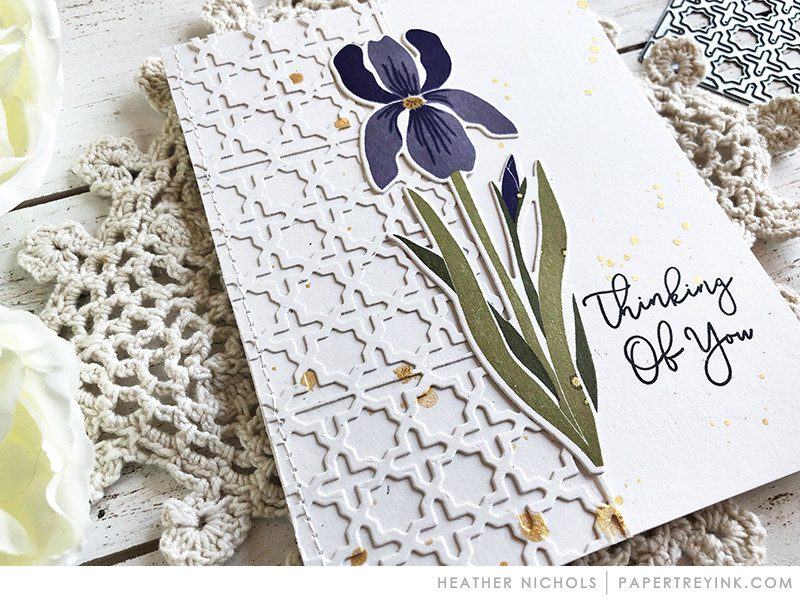 Heather’s Iris Thinking of You card is lovely. One of her rare non-Kraft cards!!! I love all the cards today! The PTI design team is so talented. Kit ‘n Caboodle is so adorable! Can’t wait to get the newest Shape Shifter! I love Kit ‘n Caboodle, I can never have enough cat stamps. Love love love! The shape shifter square is so neat and versatile that the possibilities are literally endless! Not to mention the kitty cats are absolutely adorable so I’d say this was a fabulous day of featured products! Kit n’Caboddle is so darn cute! I like the new Shape Shufter Square, and of course the CATS. I’m quite the cat lover! Cats are so cute…love the shape shifter square! Awesome inspiration from the team! Don’t cats just get into all sorts or positions….and all sorts of trouble??? Ha. So stinkin cute. I also just love the shape shifter series. I want them ALL! The cats set is adorable. The cards made with it are adorable. All of the cards are great! My favorite today is the Kit n’ Caboodle set. Thanks! 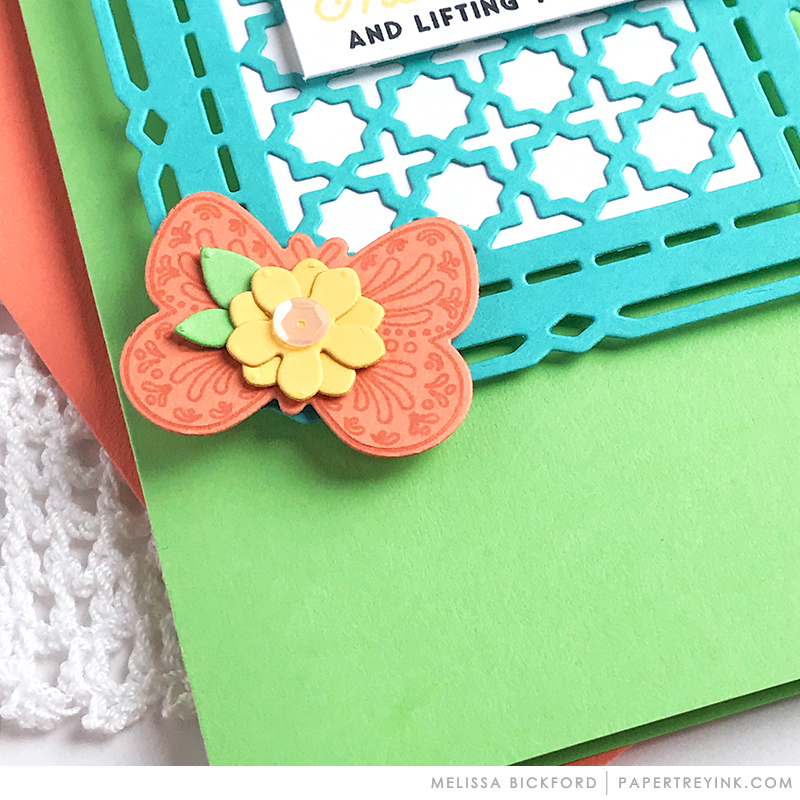 Sentiment Staples is a great series – I’m happy to see Thinking of You this month! And the cats are very sweet in all the cards and tags! Awww!! The cats are so sweet! I Am also excited about all the design possibilities for the new shape shifter. The cat is sooooo cute! And I love the new shape shifter. Those kittens are so cute! Love the one all curled up, and easy to tuck in that die cut circle! If I made cards to send myself, I’d pass on Kit ‘N Caboodle, but since I make them for others, that set will be on my list. My sister, who loves her cats, will enjoy getting cards made with that set. The new Shape Shifter is my favorite that has been released. 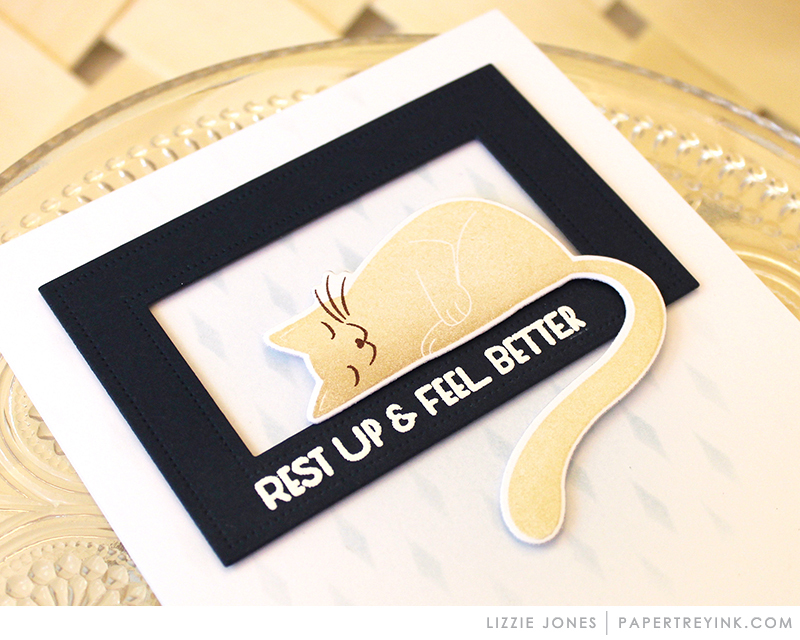 Thanks, Lizzie, for the wonderful kittie stamps, especially the peek-a-boo cat which is precious! I love the new shape shifter and all the beautiful DT cards show how versatile it can be. I am VERY excited about these kitty stamps! Love the peek-a-boo cat! Kitties! Thanks for a fun release day. 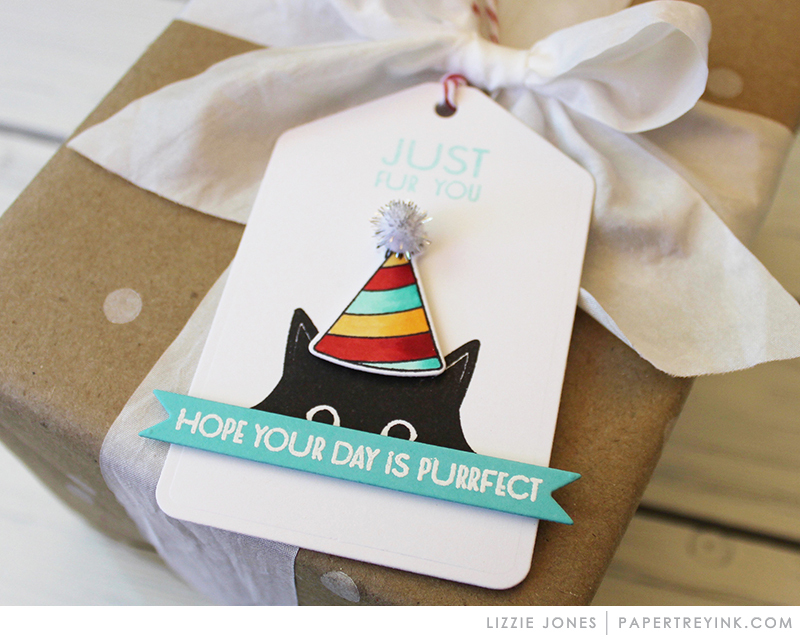 Love Lizzie’s cute peek-a-book kitty tags today! The kitties are super adorable. The Kit and Kaboodle set is so like our cat! Such a neat set. Love the cat-themed cards. Thanks for the inspiration. I love the peeking cat–so cute! I love the shape shifters square die. Such fun possibilities with this die. The kitties are so cute and I love the new Shape Shifter Square die! I’m not a cat person, but I like seeing the card examples. Cute. Oh, how cute are those kitties! 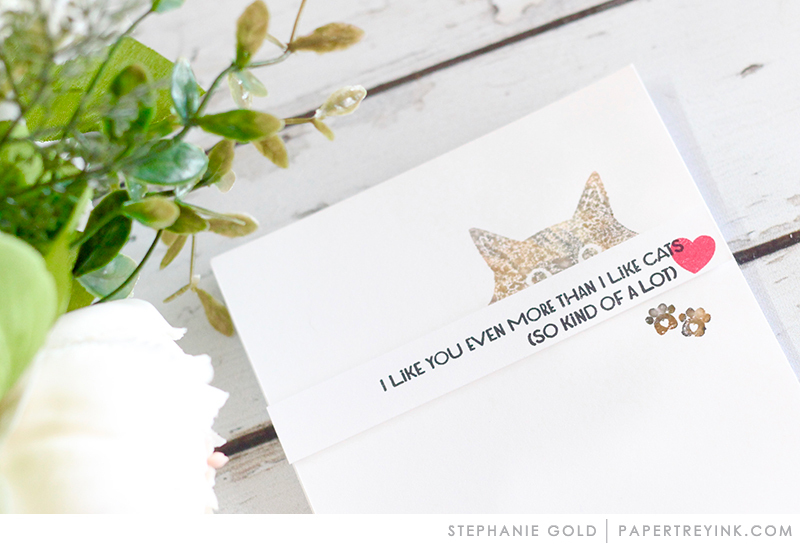 Happy that I can now make adorable cards for my cat-lovin’ friends! Awesome sample cards from everyone! Thanks for this fun release! I adore the shape shifter series and this will be a great addition. But those cats! How cute are they? Thanks to all of the PTI team for inspiring us each month. 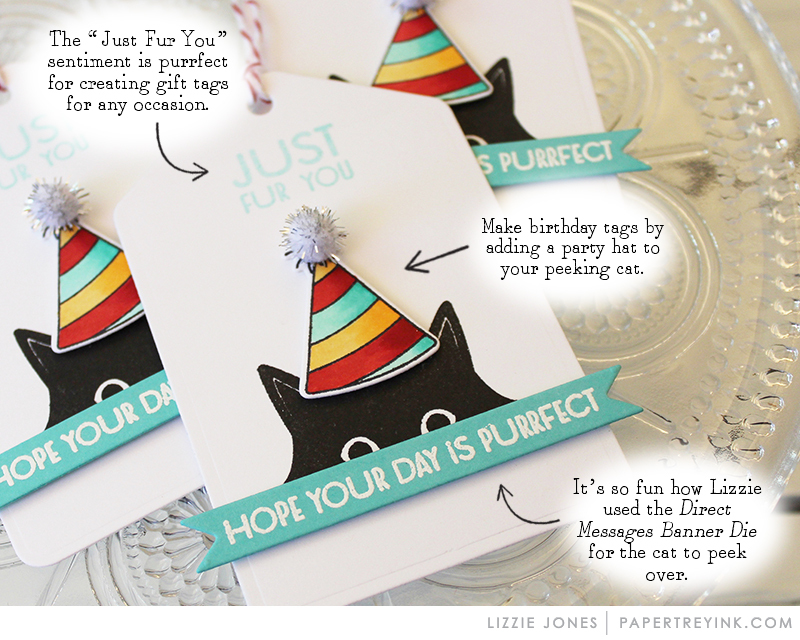 I think the projects are so adorable today, from the kitties, to the sentiment stampset and the beautiful Shape Shifter. There are so many possibilities to use all these items to make some gorgeous cards. Looking forward to tomorrow’s projects! Kit ‘N Kaboodle is purrfect for my cat loving friends! Love the Shape shifters and Thinking of You stamps!! Thanks for the great inspiration, everyone!! I love the cat stamps! They are so cute!! Totally purrrrfect… I love cats and kittens, and these are just super cute! Loving so much about these projects today, they make me want to play with everything!!!! I have so many cat-lover friends. These stamps will be perfect! I LOVE the square die! In love with the kitties! Love the Shape Shifters release this month. Lots of fun project ideas! That peek a boo cat has stolen my heart! So stinking cute! I must! Have the cat stamps and dies, plus the shape dies! Love them all! Oh my goodness! I’m just going to have the kitty set! It’s so adorable! Love the square dies as well! Those little kitties are too cute!! Fun projects! Oh the cat lover in me has to have the whole Kit n Caboodle for sure!! I also love that square with the sunny/flowery center design… kudos for a great release!!! 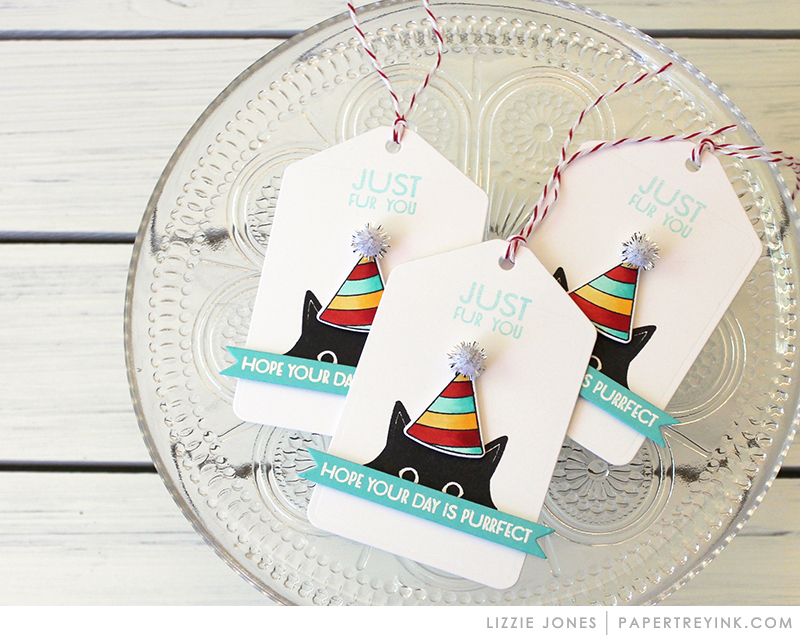 While I am not a cat person, my cat-loving friends would love those cute tags that Lizzie created. Thanks for so much creative goodness! So looking forward the Sentiment Staple Thinking of You! What a great set! Love the shape shifters and those cats! Adorable! Everything is just way too awesome! Love that whole Kit and Kaboodle set. Amazed by all the fantastic creations by the design team! Another day of fantastic projects! Really enjoying this release! The shape shifter square is really elegant! We are a household full of cats, so you can be sure that I definitely need the new cat stamps! Sooooo cute! I’m really loving everything about today’s products. Thanks PTI! Love the new shape shifters square 2 die, so versatile for lots of styles of cards and the kit n kaboodle is super cute! Those kitties look so cute! I need that cat stamp set! So adorable. Who wouldn’t love these darling cats? Very sweet. Another great new Shape Shifters! Loving the super cute cats. So many possibilities. Oh my, I am really excited about the new shape shifter square 2 dies. Wonderful inspiration from the team on your great products. I love this new Shape Shifter! It’s so versatile! 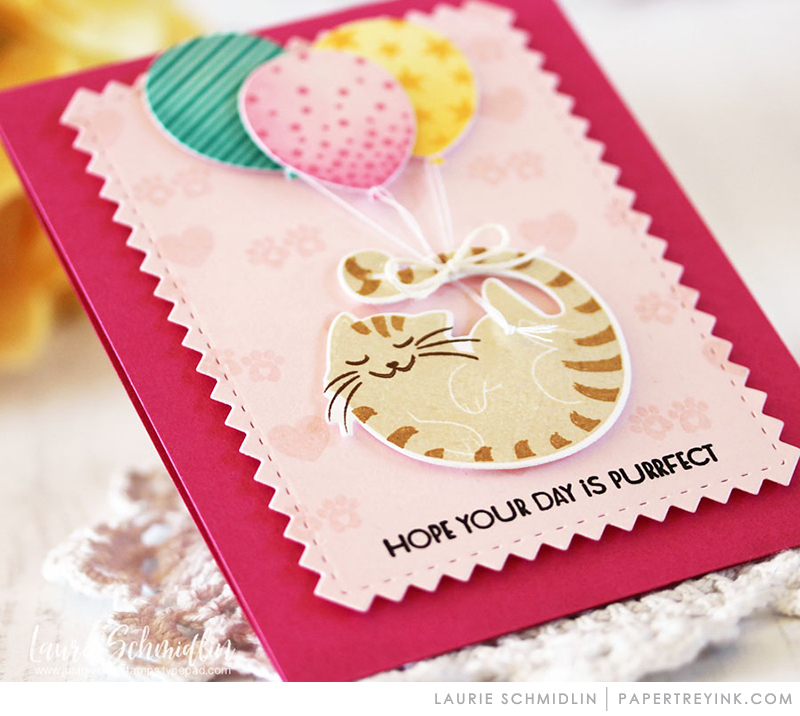 The kitties are such great fun and I love the versatile square die. Another amazing release!!! Thank you, PTI. I can see so many possibilities with the shape shifter die. Such sweet kitties! So much to love this month once again! And everyone’s project designs are gorgeous! That Shape Shifter die is a must have for me. Love all the samples by the team. I’m not usually attracted to cats but the lying-down cat in Kit ‘n Caboodle is so cute! I really love the sweet critter cards and the pretty new dies! I am so in love with the shape shifters series – can’t wait to add to my collection! The Shape Shifters is stunning! The DT did a great job of showing the versatility of the dies! I can see right now that I must have the “Kit ‘n Caboodle” set seeing that I myself might be a sort of crazy cat lady with my three fur babies! Of course, I love the other sets for today making it hard to choose exactly what I will get from this release right away. Love all the stamps with matching dies, especially love the cats set. Have found many uses for latest sifter die. I love the Shape Shifters:Square and all the great samples made with it! The Shape-Shifters series just speaks to me & this month is no exception! I will want this one also!! Those kitties are too darn cute! Lots of fabulous goodies in this release…making my wish list!! As a cat lover, totally enjoying the cat set!! Love kit ‘n caboodle. Makes me think of my two little sweeties. Kitties!!! Thank you so much! I really love the flowers. Those can be used in so many different cards.